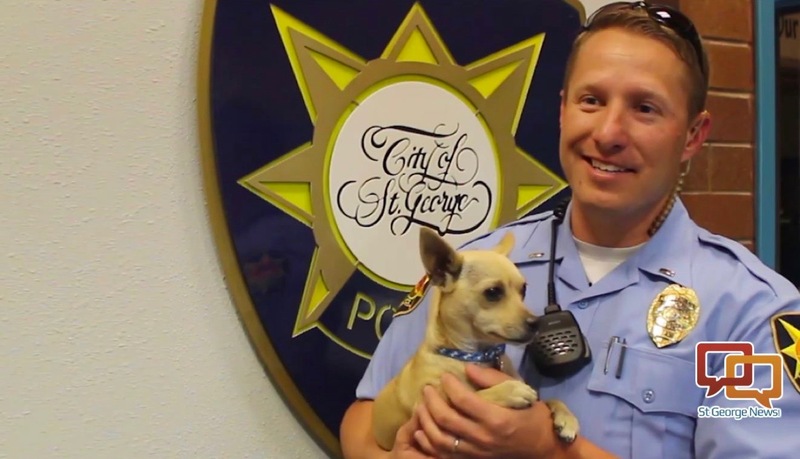 ST. GEORGE – There’s a new top dog at the St. George Police Department, and her name is Peanut. The 1-year-old Chihuahua puppy has nuzzled and licked her way into the hearts of police officers and employees since she was left at the St. George Animal Shelter last year. “It’s funny to see the reaction by tough police officers over the fact of who’s going to hold or take care of the dog next,” St. George Police Lt. Ivor Fuller said. Peanut came on the scene Jan. 19, 2016. Due to concerns for her socialization and health, it was decided she would fare better somewhere outside of the shelter. And so it was, Fuller said, that Peanut ended up riding around with him in is his police truck. One day Fuller entered the police station with Peanut and she got lost. “Or found, depending upon how you look at it,” he said. Officers and employees have latched onto Peanut who visits the Department and the nearby St. George City Offices every Thursday. 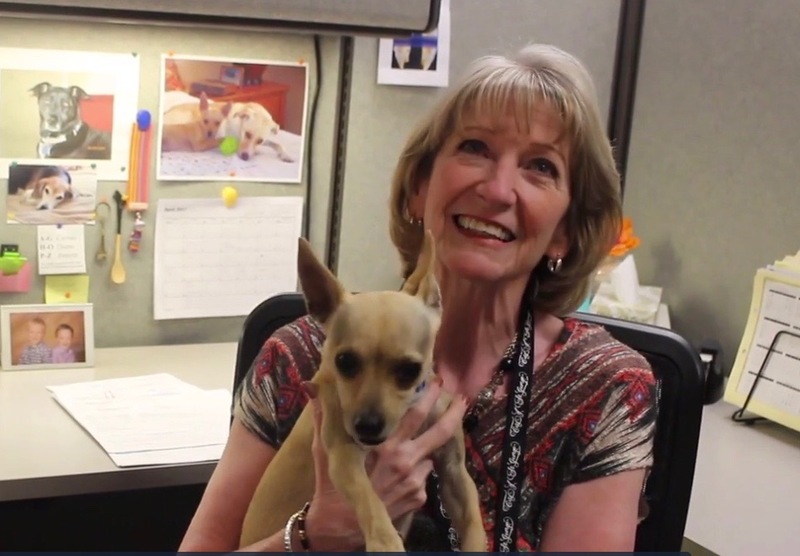 While it’s fun for Peanut to roam through the station, dropping in on officers and staff, the small dog has also had a favorable effect on those she visits. Peanut has been able to help officers and others wind down and return to reality after being in high-stress situations, Fuller said. 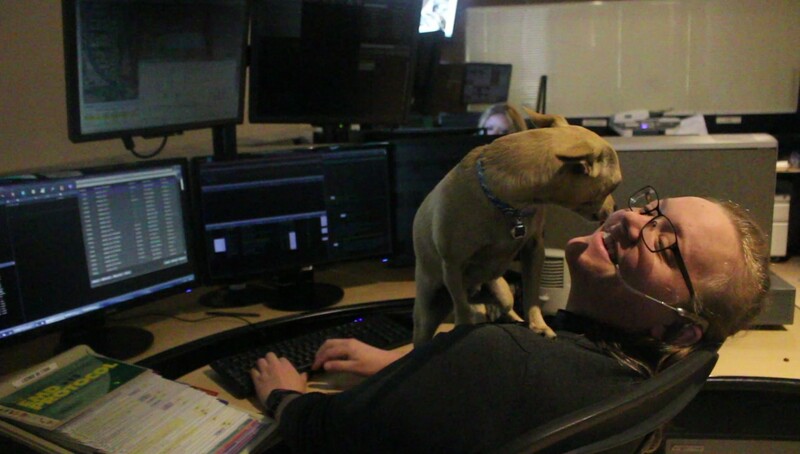 “It’s nice to have the dog because it gives you a chance to breathe and think about something else – just relieve a bit of the stress and not be quite so serious,” dispatcher Amelia Jones said as Peanut sat on her shoulder. Peanut is neither an official service or therapy dog, nor has she received any training as such. The little dog simply appears to provide a helpful service to the officers and others when needed. In exchange, she gets petted and she gets treats and a whole lot of attention when she visits the police station. “I think more and more agencies, more and more corporations, are learning they’re really a huge stress reliever,” St. George Police Officer Lona Trombley said of dogs. Peanut’s presence at the police station has resulted in records technician Susan Merrill being allowed to bring her own pet dog to work. Jilly, a 4-month-old miniature Australian shepherd, was at the office Thursday playing with Peanut. People in the office were drawn to the two dogs like moths to a flame. They laughed and engaged in baby-talk with the little dogs as Jilly ran circles around Peanut. “It’s great. We love being with her anytime we can,” said Donna Johnson, a legal secretary for the city and Peanut’s foster owner. 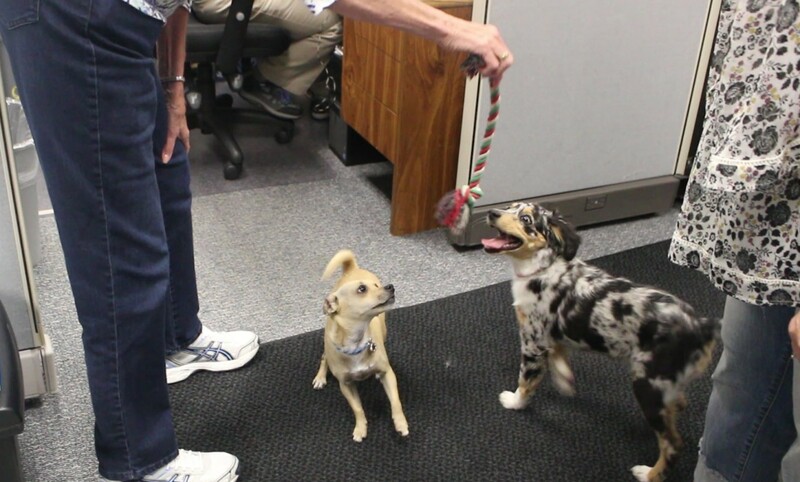 Johnson and Peanut gravitated toward each other when the dog visited the police station. Johnson offered to foster Peanut and will become her official owner this coming Monday once paperwork is out of the way. The St. George Animal Shelter has been a no-kill facility for three years now and takes in up to 1,200 animals a year, many of which are successfully reunited with their families. For those that are not, the staff works hard to find new homes through the shelter itself or partner organizations. While Peanut has been able to find a new home, perhaps you can provide a home for a dog or cat currently staying at the shelter. The St. George Animal Shelter is located at 605 E. Waterworks Road in St. George | Telephone 435-627-4350 | Facebook. Heartwarming story – good job Mori. Rescue animals make great pets. I smiled and laughed. Thank you for a great story. Adopt don’t shop.